Hello Everyone - We have set this page up as a 'blog' of our Introductions. So though the page may seem a little long, it just contains five introductions to this website that date back to 2005. They are perhaps all a bit abrupt (but we realise how busy people are, a curse of the modern world!). We hope that together they provide a good overview of what this site is about, why we think it is important. At the bottom of the page there is a nice collection of quotes that we hope will motivate you to get involved and help save our planet as a way of protecting your life and the lives of your children. Site Introduction (2012): Despite several thousand years of failure to correctly understand physical reality (hence the current postmodern view that this is impossible) there is an obvious solution. 'Reality cannot be found except in One single source, because of the interconnection of all things with one another'. Given we all experience many minds and many material things, but always in one common Space, we are thus required to describe physical reality in terms of Space. We then find there is only one solution, a Wave Structure of Matter (WSM) where the electron is a spherical standing wave. See Wave Diagrams. In hindsight the error was obvious, to try and describe an interconnected reality with discrete 'particles', which then required forces / fields to connect them in space and time. This was always just a mathematical solution which never explained how matter was connected across the universe. I realise that there are a lot of 'crackpot' theories about truth and reality on the internet, but it is easy to show that the Wave Structure of Matter is the correct solution as it deduces the laws of Nature (the fundamentals of Physics & Philosophy) perfectly (there are no opinions). While the Wave Structure of Matter is obvious once known, to begin it will seem strange simply because it takes time for our minds to adjust to new knowledge. For those who are religious / spiritual, I think Albert Einstein expresses the enlightened view of God. He writes 'I believe in Spinoza's God who reveals himself in the orderly harmony of what exists, not in a God who concerns himself with the fates and actions of human beings.' This harmony arises from a Wave Structure of Matter in Space (we are all interconnected in this space that we all commonly experience). This unity of reality (God, Brahman, Tao, Spirit, Energy, Light, Vibration) is central to all major world religions, thus their common moral foundation of 'Do unto others as to thyself' as the other is part of the self. Please help our world (human society / life on earth) by sharing this knowledge. Clearly our world is in great trouble due to human overpopulation and the resultant destruction of Nature, climate change and the pollution of air, land and water. The best solution to these problems is to found our societies on truth and reality rather than past myths and customs (which invariably cause harm). Given the Censorship in Physics / Philosophy of Science Journals (founded on the standard model / particle physics) the internet is clearly the best way to get new knowledge visible to the world. A world now in great need of wisdom from truth and reality. Hello and welcome! Please excuse the abruptness of this introduction - it is written with Albert Einstein's ideals of kindness, beauty and truth in mind. I am convinced that we have finally worked out what physical reality is. i.e. We can correctly imagine how matter exists and moves about in Space (including you and I and all other life on earth, all those stars across the universe). This website explains why I am certain this is true - why I think this knowledge is vital for the future survival of humanity. Space must be the substance which exists and matter is formed from waves in Space. In hindsight the error was obvious - to try and describe an interconnected reality from the foundation of many discrete and separate things, matter 'particles' moving around in space and time, which then required the invention of continuous forces / fields to connect the discrete 'particles'. This was always just a mathematical approach which never explained how matter was physically interconnected in Space. Conversely, the wave structure of matter (by describing reality in terms Space, the one thing all matter exists in) enables us to clearly picture how matter is interconnected. The spherical IN and OUT waves interact with all other wave-center 'particles' in the universe. Thus matter is in continual two way communication with all the matter around it (matter is active and dynamic) which explains both how it can move, and the true cause of time. An electron is simply a spherical standing wave in space. The positron (antimatter) is just the opposite phase wave. We can then show that this is the correct solution, as the Wave Structure of Matter (WSM) in Space deduces the fundamentals of Physics & Philosophy. i.e. Once you know reality it is obvious that it is correct as it explains so many things so perfectly. And the solutions are deduced, there are no opinions. I realise that there are a lot of 'crackpot' theories about truth and reality on the internet, but you can work this out for yourselves and you will see that it is correct. It is the most simple solution, it works perfectly and it is obvious once known (though it does take a while for our minds to adjust to new knowledge). Science does work, we just needed the correct (most simple) foundation of space and its wave motions (rather than the motion of matter particles and their connecting forces / fields in space and time). Physical reality (what we really are as humans) is obviously important, it is the source of all truth and wisdom. But this knowledge only helps society if the majority are aware of it. Please help our world (human society / life on earth) by sharing these pages. We are creating hell on earth by destroying Nature (a part of our true selves). Why Space is the most simple foundation for describing the world we all experience. Imagine driving your car on a busy road. There are obviously many other people driving their cars, thus many minds and material things, but they all interact in the same space. This is true when crowds of people collectively watch some event (e.g. fireworks, a sporting event, a lunar eclipse, the distant stars), we always experience many minds and material things, but always in one common Space. Thus Space is the most simple foundation for Science, as it is always perceived as the one thing that we all commonly experience. So now we must consider the Properties of Space, as Aristotle and Leibniz explained. Given the particle / wave duality of light and matter, and that we cannot add 'particles' to Space then there is only one solution: Space has the properties of a wave medium and matter is formed from wave motions of Space. Further, we know that matter interacts spherically from Einstein's relativity, thus the most simple solution is that matter is formed from spherical standing waves in Space. So how do Waves explain the 'particle' properties of light and matter? Simple. The particle effect of matter is formed at the wave-center of the spherical standing wave (see diagram) and the particle effect of light is due to resonance and discrete frequency interactions where energy E=hf (Planck's constant by frequency). Basically quantum physics is founded on wave equations, and general relativity on the mathematics for the curvature of a sphere (where matter curves space-time). So you can see that the spherical wave structure of matter unites these two central concepts of physics (Einstein's spherical geometry and quantum waves) perfectly. What about time? Well it is really a human construction, there is just the present now (space), but it is in a state of change (space is vibrating if you prefer). The future is just the In waves flowing through space that will form your future wave center 'particles', the past is your out waves. For those who are religious / spiritual, you can consider space as God (Brahman, Tao, Spirit, Energy, Light). What is certain is that discrete and separate 'particles' do not exist - we are all connected to this space that we all commonly experience. And this underlying unity of reality (God) is central to all major world religions, thus their common moral foundation of 'Do unto others as to thyself' (as the other is part of the self / we are all one with god). While I am certain that matter is formed from waves in space, there is still much to explain about our minds, our human emotions and moral / spiritual sense. This is no doubt the future of theology and our understanding of God, to explore the properties of this Space we all find ourselves existing in. Understanding this underlying unity of reality is now critically important to humanity. Our world is in great trouble, heading rapidly towards self destruction due to human overpopulation and the resultant destruction of Nature, climate change and the pollution of air, land and water, contaminating everything we consume. Clearly the best solution to these problems is to found our societies on truth and reality rather than past myths and customs which invariably cause conflict and harm. (anchor link to help section lower on this page). I am not naive to the difficulties that humanity faces. But history shows that truth eventually triumphs, that there are enough sensible logical people in the world who appreciate the importance of truth. For the past 350 years (since Newton) physics has been misled by focusing on the 'particle' structure of matter in 'space-time', rather than the more simple Wave Structure of Matter in Space. i.e. The mistake of studying light and matter 'particles' rather than the Space they exist in. Quantum Physics: The Wave Structure of Matter (WSM) provides a simple sensible solution to the particle-wave duality of light and matter. The 'particle' effect of matter is caused by the Wave-Center of the Spherical Standing Waves in Space (see Wave Diagrams). The discrete 'photon particle' properties of light are caused by standing wave interactions (resonant coupling) which only occur at discrete frequencies (thus discrete energy states, where E=hf). This is why Schrodinger's Wave Equations are used to determine the allowed energy / wave states of electrons in matter - because matter is made of waves (obviously!). Albert Einstein's Theory of Relativity also correctly realized that matter was large, a structure of space / the universe (there were no discrete little 'particles' which require 'continuous fields' in 'space-time' to connect them). Einstein just made the mistake of working from a continuous field theory of matter-energy in space-time, rather than the discrete standing Wave Structure of Matter in Space (which is why his continuous field theory failed, as it could never explain the discrete 'particle' properties of light and matter caused by discrete standing wave interactions / resonant coupling). Cosmology. If we start with this most simple foundation that only one thing exists, space, then it is necessarily infinite and eternal. From this foundation of our finite observable universe being part of infinite space we can then show that you get a redshift with distance due to decreasing overlap of Hubble spheres (finite observable universe). Basically every wave center 'particle' is at the center of its finite spherical universe within infinite space - and as matter moves further apart there is less overlap of Hubble spheres, thus less wave interactions which leads to a redshift with distance. Further, we can then deduce Mach's principle and unite finite matter with infinite space due to Huygens' principle / sharing of waves (this is very important - one of the great deductions from Milo's Wolff's pioneering work on the Wave Structure of Matter). I have spent twelve years thinking on the Wave Structure of Matter (WSM), while reading the history of physics, philosophy and metaphysics. I have met (over the internet) an emerging group of scientists and philosophers (most importantly Dr Milo Wolff) who have also independently discovered the Wave Structure of Matter, share this same certainty that it is correct due to its simplicity and power to explain many things, that this knowledge is important to Humanity. It is now clear that all matter interactions are really wave interactions in Space. We humans, and everything we experience around us (the earth and its life, the sun and stars) all exist as very complexly evolved wave centers of (spherically) vibrating space - all intimately interconnected to one another by our spherical in and out waves in space (which is why you can see stars across the universe, as they are a part of you, and you are a part of them - a nice thought really). Separate and discrete 'bodies' made of 'particles' are an illusion of the mind and how it represents our senses - the fact that we have senses tells us we are connected to things around us in Space. It is just that most wave interactions occur at the high wave amplitude wave center (of the spherical standing waves), so we have evolved to see these high amplitude wave center 'particles'. True Knowledge of Reality will transform Humanity. By understanding how things are necessarily interconnected (which is central to all science / knowledge) we can determine which of our ideas correspond to real things that exist Vs. imaginary things (e.g. dragons, particles). This certainty of truth will end the current 'postmodern relativistic' (social construct / logical positivist) view of no absolute truths that leaves postmodern philosophy, physics & metaphysics full of doubt, conflict and confusion. And clearly these errors in thinking and acting ultimately harm us and our societies. Science does work (deduced / no opinions). We can clearly imagine Reality and the physical existence of Space and its spherical standing wave motions that cause matter and its interactions. If you give truth and reality a chance they will repay you many times over, by providing true guidance (wisdom) for how to think and live on our precious planet - with much greater harmony amongst ourselves and Nature (the Universe) from which we evolved, and to which we owe our future existence. Introduction / Summary (Feb. 2007): Hi Everyone. Firstly, our thanks to the people who have taken the time to write us such Nice Letters - we really appreciate it! Below is a brief introduction & summary to this Physics Philosophy Metaphysics Website which we hope everyone will read. Over the past ten years we have read many great minds on the subjects of truth and reality (physics, philosophy and metaphysics) and collected numerous famous quotes and images which make up a large part of these pages. 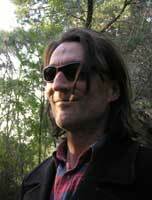 However, we wish to emphasise that the purpose of this website is not just to present existing knowledge, but rather to show that despite the postmodern view of 'no absolute truths', there is actually a very simple sensible language for understanding physical reality and thus knowing absolute truth. So let us now briefly explain this most simple science theory of physical reality and why we think it is correct. In hindsight the mistake is obvious. We start with Space (empirical senses require Space for things to exist in - we all commonly experience existing in Space). The error was to add 'time' and 'particles' to Space which then led to the problems of how these things are interconnected, thus we had to also add 'forces / fields' to connect the 'particles' in 'space-time'. Newton first formalised this particle conception of matter (which dates back to Ancient Greek Philosophy), and it became the foundation for all of Physics. However, Philosophy and Metaphysics have always known that there was an underlying Dynamic Unity of Reality, to explain the necessary interconnection of all things in the Universe. The solution is to begin and end with Space (not add other things to it!). Thus we must consider the Properties of Space. And given the particle / wave duality of light and matter, it then follows that if there are no 'particles' then we should consider if matter is a Wave Structure of Space - that Space (which we all commonly experience) exists with the Properties of a Wave Medium. Thus the Wave Structure of Matter (WSM) assumes that Space is the one thing that exists, which causes and connects the many things we experience (matter as spherical standing waves in space). This is the most Simple Science Theory for describing physical reality, and it clearly works, as it deduces (and thus unites) fundamentals of Quantum Physics, Albert Einstein's Theory of Relativity and Cosmology (see also the Problems of the Big Bang Theory). Anyone can determine the truth of this for themselves - it is deduced, not anyone's opinion. Why is this important? Well it tells us what we really are as humans, how we exist as matter in Space, how we are subtly interconnected to all other matter in the universe (which is pretty amazing when you really think about it!). And it corrects past errors of knowledge that currently cause harm not just to the Sciences, but to Society itself. i.e. To those with some knowledge of philosophy and metaphysics, it solves Aristotle's problem of Metaphysics (Prime Mover), by describing the one substance that exists (Space) and its properties (Wave Medium), which then solves David Hume's Problem of Causation and Necessary Connection by explaining how matter is necessarily interconnected to other matter in Space by its spherical In and Out Waves. This is why Science works (how logic and senses can exist), because waves behave logically due to the Properties of Space, and we can sense matter in the space around us because our spherical In Waves interact with other matter waves in the Space around us, and ultimately determine the location of our wave center 'particles'. i) Several thousand years of failure to work out reality (which is simple and obvious once known), thus most people / academics are now so skeptical that they just assume it is impossible for us to correctly imagine reality (we are trapped in the Mind!). Any mention of absolute truth and reality is deemed 'crackpot'. This is made more difficult again as the internet is full of crackpot theories on truth and reality - and most people are not natural philosophers (including most academic philosophers and physicists) thus they do not have the skills / ability to determine quality from crap, truth from fanciful imagination (this sounds harsh, but it is common observation of many philosophers, from Albert Einstein to Plato and Aristotle). iii) Most academics are now very specialised, very busy, and tend to have a vested interest in maintaining the existing knowledge foundations (since they have built a career on them). This makes it difficult for them to consider new knowledge (even if they wanted to). iv) People tend to have their own conceptions of truth and reality (which they like), and once humans have formed their ideas they rarely change. v) We have evolved from primitive tribal (herd like) animals. We are emotional / religious creatures seeking common beliefs which bind us together and enhance the survival of our tribe (we are more likely to fight for a common emotional belief, our history of warfare shows this). Thus our minds are not well suited for thinking carefully about truth and reality (we tend to be confused by our limitless imaginations and incomplete senses, often believe things simply because they are part of our ancestry and culture). vi) Finally, we only sense a fraction of the real world, which is then represented by our mind (e.g. the sky is not blue, though we do see a certain frequency of light waves as the Wave Structure of Matter explains). Likewise, we 'see' things as separate and discrete objects when reason (and physics) tell us that all things in the universe are subtly interconnected (e.g. to explain why the earth orbits the sun, how we can see stars across the universe). Given these difficulties, it seems that using the Internet is the most efficient way to get this knowledge visible to the world (thus explaining why this website exists - and why we depend upon your help). History shows that despite our human frailties, true knowledge does slowly filter into society, that there are enough sensible logical people with skeptical open minds who recognise truth when they see it. I am sure that most people realise that the world has many serious and disturbing problems. e.g. Human overpopulation resulting in pollution of air food and water, the destruction of Nature (with radical climate change a likely result), and the endless conflicts that arise when our societies are founded on custom / myth rather than truth (our current world / society). It also seems that we individuals have little power to improve things. This is something that initially depressed me, I live in Nature (on 600 acres of natural bush) and find Nature both beautiful and amazing. It is clearly true that we evolved from Nature and depend upon Nature for survival, yet as a collective we are obviously destroying Nature, thus our future survival (stop and think about your children for a moment, their future). History shows us though, that it is we individuals who do actually change the world, because it is individuals who discover knowledge, and it is knowledge that changes the world by changing how we think and live. Where we have true knowledge we tend to act more wisely (philosophy is founded on this), when our knowledge is untrue (myth, custom) we are more foolish, stupid and inclined to conflicting 'cultural / relative truths' that cause Humanity endless conflicts and brutality. I must admit that I have spent considerable time thinking about writing an introduction to this website on Truth and Reality. As a philosopher these concepts are central to all the work I do. Unfortunately, I happen to live at a time where 'reality' is more closely associated with 'reality TV', and it seems everyone is entitled to their own truths, no matter how fanciful they may be (the joy of 'relative truth'). It is almost deemed insulting to some, to suggest that there is a physical reality, and as a consequence, absolute truths that are necessarily derived from this reality. When considered though, this postmodern view of 'no absolute truths' is rather strange, because people, generally, don't jump out of windows thinking they can fly, as they recognise this absolute truth of gravity and the resultant risk of injury or death. And there are many examples of these absolute truths in daily life that we must abide by to survive, e.g. sleeping, eating, breathing, etc. So my first point is that there are absolute truths, founded on physical reality, and these are clearly important for our survival. However, of profoundly more importance is that I am now quite convinced that the source of this absolute truth, i.e. physical reality itself, has finally been discovered (i.e. we have finally worked out the correct language for describing how matter exists and moves about in Space). That careful study of these subjects of Philosophy, Physics and Metaphysics over the past ten years has convinced me (and many others) that there is a very simple and sensible way of describing reality that clearly corrects a lot of past errors and problems of human knowledge. Basically summarised, the current paradigm of representing matter as discrete 'particles' that generate 'fields' in 'space-time', while useful, is only an approximation of reality, and it causes numerous problems because of this. (This is well known, and explains the academic foundations of our postmodern culture of no absolute truths). To correct these errors it is necessary to reject the 'particle' conception of matter (as Einstein did, see below) and describe matter in terms of Spherical Standing Waves in Space that cause the particle effect at their Wave-Center. Effectively we are combining the Absolute Space assumed by Newton (1678) with the spherically spatially extended structure of matter as assumed by Albert Einstein in his Theory of Relativity (1905 - 1916) and the scalar wave properties of matter discovered by Schrodinger and de Broglie (foundations of Quantum Theory, 1928). Two further points are important here to correctly understand these central concepts of the Wave Structure of Matter. Firstly, Newton's Absolute Space was considered a 'background' reference frame for the motion (and acceleration) of matter 'particles'. Thus in Newton's Space matter did not affect Space (matter was somehow separate as 'particles'). Einstein rejected the 'particle' conception of matter and tried to unite matter and Space (and time, gravity) as one thing, by representing matter as continuous spherical fields. So in Einstein's relativity matter does affect Space, as matter and space are united (i.e. matter is spherically spatially extended and represented as a spherical field). The Wave Structure of Matter agrees with Einstein, Matter and Space are one and the same thing (there are no 'particles'), and thus matter does affect space and its properties. The central difference is we are describing matter in terms of Spherical Waves in Continuous Space, rather than Einstein's (failed) field theory of matter as Continuous Spherical Fields in Space-Time. The Wave Structure of Matter is explained in more detail in the short summary to physics below. And while I do realise that new knowledge is generally confusing to begin (a limitation of the human mind that affects us all), I can assure you, that once understood, the Wave Structure of Matter is surprisingly simple, and very obvious and sensible. Significantly, we are describing reality from One thing, Space, and its properties as a Wave Medium, rather than from Many things, Matter, and their properties of generating Fields. There are two reasons why this unity of reality is important. Firstly, Metaphysics is founded on the Principle that the many things we experience must somehow be inter-connected by One thing that causes and connects them. And this is not an abstract academic idea, it is just confirming our experience of the world (look around you and think about how you are connected to these other objects that you see in Space). I have many quotes on this unity of reality (it is the central foundation of both philosophy and metaphysics since the time of Ancient Greek and Indian philosophy) but Leibniz summarises it most concisely. Secondly, and this relates to Science, there is the fundamental principle of simplicity, Occam's razor, where the theory that describes the most things from the least assumptions is the best theory. And it is clear to anyone who takes the time to consider this, that the Wave Structure of Matter, by being founded on One thing existing, Space, and its wave motions that form matter, is the most simple way of describing reality. The scientific measure of its truth is to then show that it deduces correctly what we observe from observation and experiment, which then takes us to the pioneering work of mathematical physicist Dr Milo Wolff, who has deduced many of the central laws of modern physics from this most simple foundation for the Sciences, the Wave Structure of Matter. I believe though, that the best I can do as a philosopher is to carefully explain this knowledge as simply and sensibly as possible, and perhaps more importantly, explain why knowledge of reality and its resultant absolute truths is critically important to our future survival (particularly now, with the many problems that currently confront humanity). The real problem that this new knowledge faces is that it contradicts the current post-modern belief that it is impossible to know Reality, and thus to have Absolute Truth. All knowledge is relative to cultural constructions, which are ultimately merely ideas, not real things existing in themselves (Kantian Idealism). I suspect it would be 'academic suicide' to even use these terms of Truth and Reality in a title as I have done (though they accurately reflect the content). You are asking to be branded a 'crackpot', either ignorant of our current 'enlightened post-modern' knowledge, and thus deluded, or allowing ego and imagination to sway reason and good sense. Over the past ten years I have taken the time to study the great minds of human history (there are many beautiful and brilliant minds to read). This becomes clear as you read this website, which is filled with thousands of quotes from many great minds over thousands of years. And based upon this knowledge of philosophy, physics and metaphysics, it is now clear to me that the Wave Structure of Matter is a far better way to describe Reality than the current paradigm of particles and fields in space and time. Clearly, if this knowledge of the Wave Structure of Matter is correct, then it is very important to Humanity, and has the power to solve many of our problems, both in the spheres of human knowledge, and how we are to live on Earth (without destroying ourselves and the Nature which created us and upon which we depend). As I see it, the world needs our help, and this help must be founded on the Truth, not just our good intentions, if it is to actually work and make things better. In a busy world I urge people to take the time to read and think about the Wave Structure of Matter. Truth and Reality are not only fascinating subjects, they describe what we really are as Humans, how we have evolved to exist as matter in this Space of the universe, and thus offer great wisdom as to how we should live here on our fragile and most amazing little planet, our dear Earth and its wonderful diversity of life. So there you have it - the end of the serious lecture / introduction (sorry!). My hope is that it encourages you to take the time to read the following summary of the Wave Structure of Matter (which is only a couple of pages long and i think it is very useful!). You will also find in this website many articles on philosophy, physics and metaphysics that I believe explain and solve most of the major / central problems of these fields of knowledge. And yes, I appreciate that this claim clearly falls in the class of 'crackpot', however it is also the obvious consequence of correctly knowing physical reality. So i hope you will think about it! Geoff Haselhurst Email, (December 2005). So how do we solve these problems? I think the simplest way to explain this is to list these central concepts of physics, show which path Albert Einstein took to try and unite them from a common foundation (which he failed to do), and then demonstrate from the most simple foundation (founded on One thing Space existing as a Wave Medium) how we can finally unite these concepts in a meaningful way that describes reality without paradox or contradiction. Now I know that most of you will be very skeptical of such a big claim, but the solution is pretty simple and obvious once known so I hope you will persevere (and it is concise / short!). Newton's Mechanics - Space, Time, Matter as Particles with 'Mass', Force = Mass by Acceleration. Discrete Quantum Theory (Planck, Einstein, de Broglie, Schrodinger, Born) - Light as Discrete Particles (Photons), Scalar Waves, Probability Waves, Particle Wave Duality (Light & Matter), Quantum Entanglement (apparently non local theory - appear to be instantaneous matter interactions). In hindsight it is easier to understand Einstein's error - the clue is that Quantum Theory's discovery of the wave properties of matter did not occur until 1928, whereas Einstein's continuous electromagnetic field foundations were developed from 1905 to 1916 based largely on the ideas of James Clerk Maxwell (Maxwell's Equations, 1870s) and Lorentz's Theory of the Electron (1900). So basically his mistake was to work with fields in space-time (mathematical) rather than real waves in Space (physical), largely because he did not have knowledge of the Wave properties of matter when he developed his Theory of Relativity. In terms of the Metaphysical foundations of Physics, the central error has been to try and describe reality from the Many material things we experience, matter 'particles'. (i.e. Science, which is empirically founded). And even though Einstein rejected the 'particle', his field theory of matter is still founded on this priority of matter (that matter's field interactions cause the effect of space and time). Matter as Spherical Waves in Continuous Space. 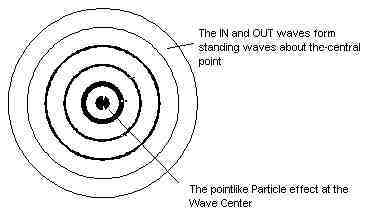 + = This rough diagram shows how the In-Waves and Out-Waves form a Standing Wave around the Wave-Center 'particle'. Significantly, we have now decreased the number of concepts from Einstein's 5 (continuous, spherical, fields, space, time) where there is no clear understanding of how they are connected, down to 4 concepts (spherical, waves, continuous, space) where we can clearly connect these four things back to One thing existing, Space, and its Properties as a Wave Medium for Spherical Waves that form matter. And after you have studied philosophy and metaphysics for a while, you come to realise that this solution to the most central and profound of all problems, the Problem of the One and the Many, of how the many things are caused and connected by the One thing then enables you to explain and solve numerous other problems that this lack of knowledge of necessary connection caused. The discrete 'particle' effect of matter is caused by the Wave-Center of the Spherical Standing Waves (the diagram shows that this is an obvious solution to the particle / wave duality of matter!). The discrete 'particle' effect of light is caused by discrete Standing Wave Interactions / Resonant Coupling. Time is caused by Wave Motion (as spherical wave motions of Space which cause matter's activity and the phenomena of time). Forces / Fields are caused by wave interactions of the Spherical In and Out Waves with other matter in the universe which change the location of the Wave-Center (and which we 'see' as a 'force accelerating a particle'). Quantum Entanglement is likewise caused by the Interaction between the In and Out-Waves and all the other matter in the universe, thus matter is always subtly connected to other matter in the universe (i.e. matter is large not small, we only see the Wave-Center and have been deceived by its 'particle' effect). However, Einstein's 'Locality' is correct, all matter to matter interactions are limited by the velocity of Waves in Space. Of most significance (the real beauty of this solution) is that not only does it solve the problems of Albert Einstein's Theory of Relativity, but it also solves the basic problems of Quantum Theory / Quantum Mechanics (founded on Wave Equations) and Cosmology (uniting finite matter & universe with infinite eternal space - The Big Bang Theory being founded on a basic error). i) The underlying dynamic unity of reality (which the Wave Structure of Matter in Space clearly explains) has been known for thousands of years (though this has largely been ignored by western scientists, Einstein, Schrodinger and Bohm are the most famous exceptions). ii) If you want to change / improve the world, well it is up to you, and it requires knowledge of truth, and thus reality (good intentions are not good enough - in fact they just lead to hell on earth). (Rachel Carson) We stand now where two roads diverge. But unlike the roads in Robert Frost's familiar poem, they are not equally fair. The road we have long been traveling is deceptively easy, a smooth superhighway on which we progress with great speed, but at its end lies disaster. The other fork of the road - the one 'less traveled by' - offers our last, our only chance to reach a destination that assures the preservation of the earth. The choice, after all, is ours to make. (Margaret Mead) Never doubt that a small group of thoughtful committed citizens can change the world, indeed it is the only thing that ever has. We must not conceal from ourselves that no improvement in the present depressing situation is possible without a severe struggle; for the handful of those who are really determined to do something is minute in comparison with the mass of the lukewarm and the misguided. ... Humanity is going to need a substantially new way of thinking if it is to survive. Physical objects are not in space, but these objects are spatially extended (as fields). In this way the concept 'empty space' loses its meaning. ... The field thus becomes an irreducible element of physical description, irreducible in the same sense as the concept of matter (particles) in the theory of Newton. ... The physical reality of space is represented by a field whose components are continuous functions of four independent variables - the co-ordinates of space and time. Since the theory of general relativity implies the representation of physical reality by a continuous field, the concept of particles or material points cannot play a fundamental part, nor can the concept of motion. The particle can only appear as a limited region in space in which the field strength or the energy density are particularly high. The subtlety of the concept of space was enhanced by the discovery that there exist no completely rigid bodies. All bodies are elastically deformable. (Erwin Schrodinger) What we observe as material bodies and forces are nothing but shapes and variations in the structure of space. Particles are just schaumkommen (appearances). ... The world is given to me only once, not one existing and one perceived. Subject and object are only one. The barrier between them cannot be said to have broken down as a result of recent experience in the physical sciences, for this barrier does not exist. ... Let me say at the outset, that in this discourse, I am opposing not a few special statements of quantum mechanics held today (1950s), I am opposing as it were the whole of it, I am opposing its basic views that have been shaped 25 years ago, when Max Born put forward his probability interpretation, which was accepted by almost everybody. ... I don't like it, and I'm sorry I ever had anything to do with it. ... The scientist only imposes two things, namely truth and sincerity, imposes them upon himself and upon other scientists. (David Bohm, Wholeness and the Implicate Order, 1980) The notion that all these fragments is separately existent is evidently an illusion, and this illusion cannot do other than lead to endless conflict and confusion. Indeed, the attempt to live according to the notion that the fragments are really separate is, in essence, what has led to the growing series of extremely urgent crises that is confronting us today. Thus, as is now well known, this way of life has brought about pollution, destruction of the balance of nature, over-population, world-wide economic and political disorder and the creation of an overall environment that is neither physically nor mentally healthy for most of the people who live in it. Individually there has developed a widespread feeling of helplessness and despair, in the face of what seems to be an overwhelming mass of disparate social forces, going beyond the control and even the comprehension of the human beings who are caught up in it. (Lee Smolin, 1997) A successful unification of quantum theory and relativity would necessarily be a theory of the universe as a whole. It would tell us, as Aristotle and Newton did before, what space and time are, what the cosmos is, what things are made of, and what kind of laws those things obey. Such a theory will bring about a radical shift - a revolution - in our understanding of what nature is. It must also have wide repercussions, and will likely bring about, or contribute to, a shift in our understanding of ourselves and our relationship to the rest of the universe. (Karl Popper, 1975) In my opinion, the greatest scandal of philosophy is that, while all around us the world of nature perishes - and not the world of nature alone - philosophers continue to talk, sometimes cleverly and sometimes not, about the question of whether this world exists. They get involved in scholasticism, in linguistic puzzles such as, for example, whether or not there are differences between 'being' and 'existing'. ... Denying realism amounts to megalomania (the most widespread occupational disease of the professional philosopher). ... If a theory corresponds to the facts but does not cohere with some earlier knowledge, then this earlier knowledge should be discarded. There is nothing more necessary than truth, and in comparison with it everything else has only secondary value. This absolute will to truth: what is it? Is it the will to not allow ourselves to be deceived? Is it the will not to deceive? One does not want to be deceived, under the supposition that it is injurious, dangerous, or fatal to be deceived. ... Do not allow yourselves to be deceived: Great Minds are Skeptical. (Immanuel Kant, 1781) It is the duty of philosophy to destroy the illusions which had their origin in misconceptions, whatever darling hopes and valued expectations may be ruined by its explanations. ... and thus to prevent the scandal which metaphysical controversies are sure, sooner or later, to cause even to the masses. (David Hume, 1737) And though the philosopher may live remote from business, the genius of philosophy, if carefully cultivated by several, must gradually diffuse itself throughout the whole society, and bestow a similar correctness on every art and calling. When we look about us towards external objects, and consider the operation of causes, we are never able, in a single instance, to discover any power or necessary connexion; any quality, which binds the effect to the cause, and renders the one an infallible consequence of the other. There is required a medium, which may enable the mind to draw such an inference, if indeed it be drawn by reasoning and argument. What that medium is, I must confess, passes my comprehension; and it is incumbent on those to produce it, who assert that it really exists, and is the origin of all our conclusions concerning matter of fact. This question I propose as much for the sake of information, as with an intention of raising difficulties. I cannot find, I cannot imagine any such reasoning. But I keep my mind still open to instruction, if any one will vouchsafe to bestow it upon me. We find in the course of nature that though the effects be many, the principles from which they arise are commonly few and simple, and that it is the sign of an unskilled naturalist to have recourse to a different quality in order to explain every different operation. (Gottfried Leibniz, 1670) I agree with you that it is important to examine our presuppositions, thoroughly and once for all, in order to establish something solid. For I hold that it is only when we can prove all that we bring forward that we perfectly understand the thing under consideration. I know that the common herd takes little pleasure in these researches, but I know also that the common herd take little pains thoroughly to understand things. ... a distinction must be made between true and false ideas, and that too much rein must not be given to a man's imagination under pretext of its being a clear and distinct intellection. ... Reality cannot be found except in One single source, because of the interconnection of all things with one another. ... I do not conceive of any reality at all as without genuine unity. ... I maintain also that substances, whether material or immaterial, cannot be conceived in their bare essence without any activity, activity being of the essence of substance in general. No two or more substances can have the same attribute and it appertains to the nature of substance that it should exist. It must therefore exist finitely or infinitely. But not finitely. For it would then be limited by some other substance of the same nature which also of necessity must exist: and then two substances would be granted having the same attribute, which is absurd. It will exist, therefore, infinitely. 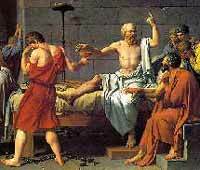 (Aristotle) The first philosophy (Metaphysics) is universal and is exclusively concerned with primary substance. ... And here we will have the science to study that which is just as that which is, both in its essence and in the properties which, just as a thing that is, it has. The entire preoccupation of the physicist is with things that contain within themselves a principle of movement and rest. And to seek for this is to seek for the second kind of principle, that from which comes the beginning of the change. Are you not ashamed that you give your attention to acquiring as much money as possible, and similarly with honour and reputation, and care so little about wisdom and truth and the greatest improvement of the soul, which you never regard or heed at all?